It all begins with an invitation to enter into a period of inquiry with the Missionaries of the Precious Blood (C.PP.S.). During this time a potential candidate is introduced to the Precious Blood Community: its mission, spirituality and community life. A man in the inquiry phase meets regularly with a vocation sponsor, completes a discernment journal, attends discernment retreats and visits our house of initial formation in Chicago. He is encouraged to be involved in some form of ministry and to seek out spiritual direction. During this time, which generally lasts from six months to two years, the inquirer may begin the application process, which includes psychological, behavioral and medical assessments. An admission committee reviews the application, which makes recommendations about the inquirer to the leadership of the Community. If approved, the candidate begins initial formation, which lasts two to five years. Candidates in initial formation live in community with one another and with the Community’s director of initial formation at Gaspar House (named after our founder, St. Gaspar del Bufalo). They gather for prayer, reflection and celebrate the Eucharist together. They share in the chores of everyday life. They learn more about the mission, ministries and spirituality of the Missionaries of the Precious Blood. In initial formation, candidates are usually enrolled in undergraduate classes. If they have not yet obtained a bachelor’s degree, they usually do so during this time. They are also encouraged to study Spanish to better communicate with members of our international community. Candidates also meet with spiritual directors and are engaged in some kind of ministry. After initial formation, the candidate makes his First Commitment to the Community, after which he enters special formation. During the special formation summer program, candidates travel to the Missionaries’ other units, called provinces, and also to women’s congregations devoted to the Precious Blood. They are also introduced to the C.PP.S. lay associates, called Companions. Special formation candidates live as interns with members of the Community in Precious Blood parishes. They see and experience a life of service as it is lived out day to day. The special formation program for our candidates lasts 15 months. After special formation a candidate may be temporarily incorporated into the Community. At this time, it is usually clear to the candidate whether he is preparing for life as a priest or as a religious brother. A priest is ordained by a bishop and can administer the sacraments. A religious brother makes a profession, or permanent commitment, to the Community then lives a life of service, ministry and prayer. A brother’s ministry can take many forms. Some of our Precious Blood brothers are teachers, campus ministers, hospital chaplains or music ministers. Some help out at parishes; others work in administration or help maintain Community houses. The next step is advanced formation. In advanced formation, a candidate focuses specifically on his future ministry in the Church. He continues to live in community at our House of Advanced Formation in Chicago and engages in ministry. He takes courses and/or training to better prepare him for the consecrated life. During this time, priesthood candidates complete a Masters of Divinity program at Catholic Theological Union in Chicago. Brother candidates participate in programs that prepare them for ministry, utilizing the gifts they bring to the Community; they may also complete an academic degree. Advanced formation usually lasts from three to five years, after which the candidate makes Definitive Incorporation into the Community, during which he makes a permanent commitment to the C.PP.S. 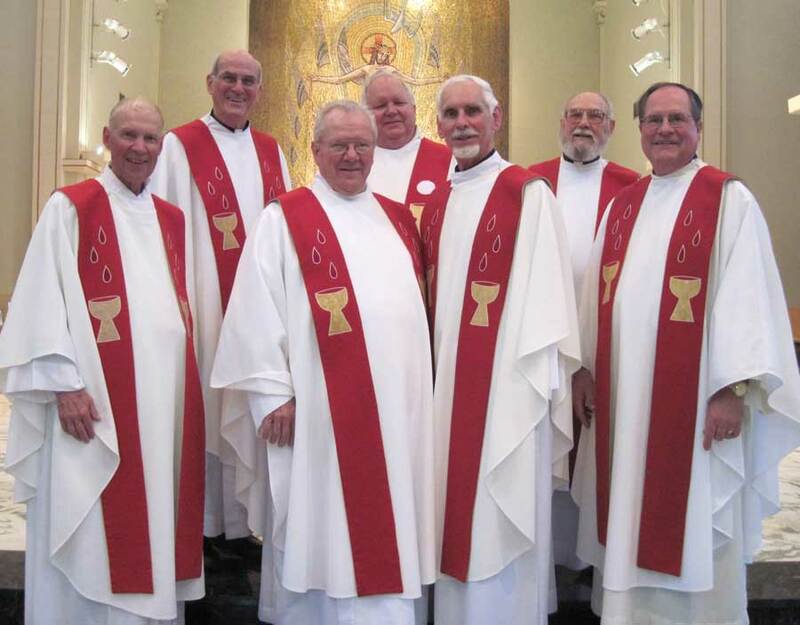 Priesthood candidates are ordained as transitional deacons, and serve a deacon internship for six months to a year at a Precious Blood parish. For brother candidates, the definitive incorporation rite, celebrated as part of a Community liturgical celebration, is considered the final step in formation toward life as a religious brother.